Way is working with the Korowai people in Papua. He lived a wicked life before conversion. He was a notorious drunk and thief and was avoided by the people in his village because of his brutality. However, the Lord opened his heart through the Gospel, and he trusted in Christ. He is now serving Christ by proclaiming the same gospel that radically changed his own life. Every day I was drunk with alcohol. I lived to drink. I would stand in the middle of the street and harass people. I would demand money and sometimes hit them. I would block the road until they gave me what I wanted. I would drink all day and find myself waking up in some ditch alongside the way. I did not care about anyone. I stole many things from other people. Stores near the streets knew who I was and knew I was trouble. I also was not married at the time and dealt in prostitution. I was always lying to my friends, family, and others. If I could trick them or cheat them, I would. I was a lying, thieving drunkard. These are the things that showed who I was before I knew the Lord. One day after heavy drinking and bothering people on the road, a crowd became angry with me, and a fight started. Suddenly, I was hit on top of my head with a large board. I was drunk and unconscious. The crowd thought I was dead, so they carried me to a nearby trash pit and threw me in it. I was left for dead. I awoke the next day. I was covered in my blood. I stood up and walked home. My mother heard the gospel through missionaries in the mountains. She followed Jesus. However, I never entered a church or cared about those Christians. My mother would pray to God for my salvation with many tears. 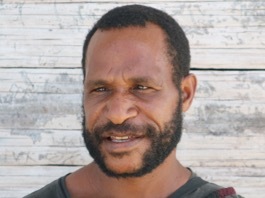 It was this week that the Lord Jesus sent to me Jimmy W., an evangelist in the Korowai. He told me about Jesus and how He died for sinners. Jimmy shared Proverbs 8:35, "For whoever finds me finds life, and obtains favor from the Lord." I was so captivated by Jimmy; I followed him around everywhere he went. I followed him to church on Sundays and saw people loving Jesus and living for Him. The Lord Jesus used His servant Jimmy to bring me to Christ. With hearing God's word from Jimmy in 2007, I repented of my sin. People that knew I was a drunk, a thief, and a troublemaker saw me on the streets after my conversion and were amazed. The people that feared me were shocked to see me being kind and not drinking or causing trouble which was a great opportunity for me to tell them what Jesus did. In 2008, I entered a Bible school in the Highlands, the Lani Theology Bible School. I completed my studies in 2011. Then I immediately came Bible School in Jayapura studying the Bible in the Indonesian language. Since returning to Jayapura, I have been attending and serving at Gereja Torsina Kilo 9—a Lani church where Jimmy is sent out to the Korowai. I want to be an evangelist wherever God leads me. I have visited the Korowai area with Jimmy W. and Paul S. If God allows, this is an excellent area to minister. (Praise God Yus is now the official Evangelist for Mabuwage). Last year, the Lord gave me a wife. Her name is Epson Wa. She is Lani and is 19 years old. We have a daughter. Her name is Ruski. None of this has happened because I am capable, but only because Jesus Christ our Lord is capable.